A video drawing attention to the eugenic discrimination against unborn babies with Down syndrome went viral this week, but the source of its new popularity is surprising. Well-known actor Ashton Kutcher (“That 70’s Show,” “The Ranch”) posted the video, a powerful speech by Special Olympian Frank Stevens, on his Facebook page last Friday, Fox News reports. “Everyone’s life is valuable,” Kutcher wrote when he shared it. It’s not clear if Kutcher is pro-life, but it is rare to have a celebrity share such a powerful testimony condemning abortion. In the video, Stevens testifies before Congress about the importance of protecting individuals with special needs – both in and outside the womb. 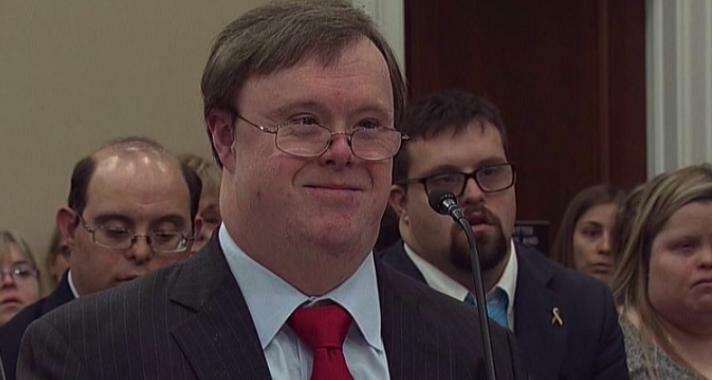 Stevens, who has Down syndrome himself, told lawmakers: “Whatever you learn today, please remember this: I am a man with Down Syndrome and my life is worth living. Sadly, across the world, a notion is being sold that maybe we don’t need research concerning Down Syndrome. Stevens lamented how abortion is being used to eliminate children with disabilities. Unborn babies with Down syndrome and other disabilities are targeted for abortions. Parents of unborn babies with disabilities frequently report feeling pressure to have abortions by doctors and genetic counselors. The rate of abortions after a Down syndrome diagnosis is about 67 percent in the U.S., according to CBS News. Some put the rate as high as 90 percent, but it is difficult to determine the exact number because the U.S. does not keep detailed statistics about abortion. In some countries, like Iceland, though, it’s 100 percent. The Blaze reports the video went viral after Kutcher shared it, and it now has 6 million views. It was a pleasant surprise from such a well-known actor, especially at a time when the abortion debate is boiling nationwide. But what made the post especially interesting is that Kutcher’s wife, Mila Kunis, has been a vocal advocate for abortion and Planned Parenthood. Click here to read full article. Site Design By Smithworks Consulting.